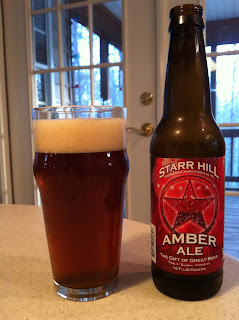 I promised recently that I'd share my thoughts on Starr Hill Amber Ale. As a man of my word, I was compelled to sit down with a glass of this beer from the Starr Hill Jambeeree pack recently. Truth be told, I had planned to enjoy a "bigger" beer that evening, but after having spent over 7 hours shooting a USPSA match, I decided on something a bit more sessionable with which to wind down the evening. Starr Hill Amber Ale pours a dark amber color with a thick off-white head. The head lingers in a thin layer throughout the drink. The aroma is caramel malt with an earthy note and is followed by a sweet malt flavor with just a hint of toasted bitterness. The sweet malt lingers for a long time in the finish. This Irish Red Ale is a little sweeter than others I've had, but it is not cloying and is very drinkable. At just 4.8% ABV, Starr Hill Amber is a refreshing drink that would be just right on a warm summer evening. It certainly hit the spot after a long and tiring day of shooting.